Stay connected. Become a member today! Members of the Alumni Association also enjoy the following benefits. Members receive access to all 23 CSU libraries with full borrowing privileges for the circulating book collection. Hours for Library spaces and services are available on the Library hours page. Please visit the Library homepage for up-to-date information about Library services. Additional information on specific services available to Alumni Association members can be found at the LIbrary Services and Patron Types page. Learn more about printing options. NOTE: Online databases, electronic books and electronic journals are not available by remote access. An SFSU email account is not included. Some Library collections and services are available only to currently affiliated SF State students, faculty and staff. Friends of the Library receive even more benefits. Depending on membership level, available benefits include use of guest laptops. Learn more about Membership Privileges and Categories. Read about WiFi connectivity options and settings. The Mashouf Wellness Center, a 118,700 square-foot, LEED Platinum Certified building, recently opened at San Francisco State University. Supporting general well-being by providing wellness programs and activities for the SF State community, this state-of-the-art facility offers a variety of amenities including group fitness classes, a climbing wall, lap pool, sauna, racquet ball courts, and more! A membership to the Mashouf Wellness Center is available to purhase for members of the Alumni Association and grants you access to the entire Center and all it has to offer. To tour the Mashouf Wellness Center, to learn more about memberships and schedule your visit contact the Membership Coordinator at mwc@sfsu.edu. Learn more about options and pricing for members of the Alumni Association. The Multimedia Education Resource for Learning and Online Teaching (MERLOT) is a program of the California State University, partnering with education institutions, professional societies, and industry, and alumni are invited to: Access Online Journals and Articles Browse the Worldwide Collection of Online Course Curriculum by Language and Subject Area Connect with other educators, K-12 teachers, college and University faculty, education staff and administrators, and librarians For more information, go to Personal Collections and create your account online. For more information on the plans, call 1-888-560-2586, or visit the SFSU Alumni Services website. Did you know your alumni benefits include a special discounted rate on car insurance and home insurance from? Find out more and get a free quote from Liberty Mutual Auto & Home Insurance on their website or by calling 800.868.1689. Access the exclusive e-portfolio network for students and alumni to display your on-campus and post-graduate work and accomplishments, while enhancing your resume and online presence by showcasing your best projects and presentations on Portfolium. Upload your best endeavors — art projects, engineering designs, legal briefs, videos, or presentations — and an update will be sent to companies with open positions in your field! Access to hundreds of live and recorded career webinars, including Careers in Pharmaceuticals, How to Get a Job at Google, Succeeding as an Entrepreneur, and many more. Webinars are 20 to 50 minutes in length by current or former employees who are experts about specifics of their industry, the jobs therein and how to increase your chances to get a job there. A Career Services & Leadership Development (CSLD) membership, with access to the Enterprise Computer Lab, job listing binders, career resource library, and Handshake to help you more easily connect with employers for jobs and internships, workshops, career fairs & event information, and on-campus recruiting opportunities. Myers Briggs Type Indicator (MBTI)* Career Report, providing useful insights into your personality and ideal work style to identify potential best-fit job families and occupations. Online access to a series of career-focused recordings, slides and resource list presented by faculty members in the Department of Counseling. Invitation to the official Alumni Association LinkedIn Group to discover inside connections and build professional networks with trusted peers, which includes job postings from some of the better announcements found in the job listing binders of the CSLD. An exclusive perk extended to SF State Alumni Association members on iPad® and Mac® products from the SFSU Bookstore: Rarely discounted Apple products can be purchased by members with the same education discount typically extended to active students only. 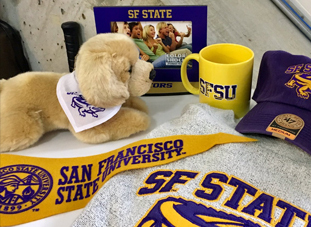 Also, members can save 10% off a wide variety of SF State branded clothing and gifts using the SF State Alumni Association membership card in the store and save 20% off online purchases with seasonal promo codes available throughout the year. SF State has partnered with HotelStorm to bring exclusive hotel discounts to our alumni community. Simply search the website for your favorite destinations — whether business or leisure – and you'll save up to 55% over other online travel agencies. Receive up to 20% off SFO parking and airport parking at several other major airport areas in the US with no restrictions and no black-out dates on Cheap Airport Parking with a special promo code available to members of the Alumni Association. Save nearly 15% on admission to the California Academy of Sciences by purchasing your ticket in advance online with the “SFSU” sales code. It’s a planetarium, aquarium, natural history museum all under one living roof! A 15% discount is available from ProFlowers, Personal Creations, Shari’s Berries, and Gifts.com, offering a wide assortment of floral arrangements, plants, chocolate covered strawberries, delicious cake pops, and expertly curated gifts for any occasion. Save up to 35% from Orlando Employee Discounts of Florida, the largest wholesaler of tickets for Disney World, Universal Studios Orlando, Sea World, and other Orlando theme parks and attractions. And for American Automobile Association members in Southern California, with a membership in the Alumni Association, you can save up to 7.4% on AAA's auto policies! Sign-up today to receive promo codes and discounts with your membership or contact alumni@sfsu.edu for further information. Diploma Display offers several exclusively designed college/university diploma frames, which makes the perfect college graduation gift. Visit www.diplomadisplay.com/sfs to order one of these hand crafted, cherry stained frames. 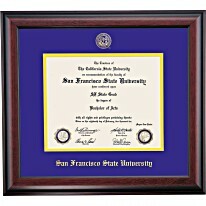 You'll enjoy preserving your achievement and showcasing you hard work in one of Diploma Display hand crafted frames.